Today was my first day of my aerial silks and Lyra training classes. I decided to start aerial silks and Lyra as a form of supplemental workout in addition to my pole training. Aerial silks is an artistic acrobatic activity utilizing specialized fabric that assists in suspending the body in the air during poses and drops. Aerial silks is often a performance activity. Aerial silks requires an immense amount of upper body strength. Although fun, aerial silks can be a dangerous activity as the performer must rely on strength an appropriate use of the fabrics. Lyra is also know as aerial hoop. Lyra utilizes a steel hoop where performers suspend their body in poses while the apparatus is fully capable of moving in multiple directions. The aerial hoop can be any shape other than circular. The specific Lyra I used during my lesson was a tear drop shape. I began my lesson on the Lyra. I learned some basic holds while getting comfortable with using the Lyra. I found this activity to be quite tiresome. The Lyra requires a lot of total body strength to smoothly execute all the positions. The Lyra also requires a lot of balance. 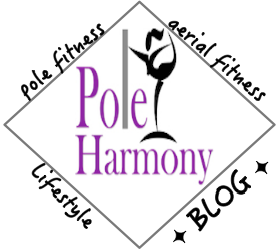 I found that my experience with pole dancing helped me with body awareness. I was able to catch on quickly and use some down time to gain confidence with my comfort level. The second portion of class involved the aerial silks. I found that aerial silks is very similar to pole. I was easily able to climb up the silks based on my pole climbing experience. I also got to lift into an invert and practice a few of my favorite modified pole moves. The only negative about silks is the potential for burns. If you move your skin too quickly over the fabric, you can get a burn. I found I'd gotten a minor burn on my outer ankle due to climbing and practicing my foot locks. Over all I was very pleased with my lesson. I was able to bring a camera and record my progress, which I found to be extremely helpful during the lesson as it enabled me to easily see what I looked like during moves and what needed improvement. I'd recommend aerial silks and Lyra for those who have been training for a considerable amount of time in a work out that involves a lot of upper body strength such as pole fitness. This is not an activity that can easily be done if you lack the ability to maintain a slow and controlled movement of your body while in the air. I look forward to sharing my progression and can't wait for next week's class!